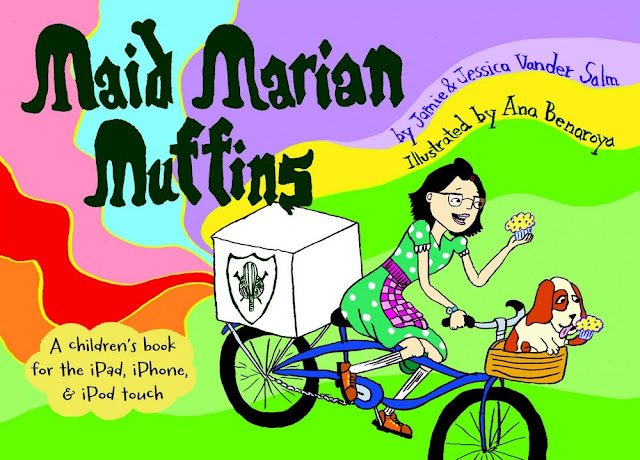 We always love positive bicycle imagery here at Cycle Chic so we were rather pleased (and became quite hungry) when Jessica sent us an email about Maid Marian Muffins - a Brooklyn-themed children's book app. Maid Marian Muffins is a light-hearted tale of a muffin fan's journey from mere muffin admirer to Brooklyn baking sensation. It's based on Jessica's real-life adventures as Brooklyn's one and only bicycling baker. The book features 36 pages of beautiful, hand-drawn illustrations by Ana Benaroya, along with a rich storyline, vividly and lyrically told. The primary interactive feature of the app is a powerful and artfully constructed self-record mechanism, one designed (by two teachers -- one former, one current) for children to use, enjoy, and understand all by themselves. Here's the link to the app in the US iTunes store.